My etching and photopolymer plate of The Giant Burrowing Frog "GBF" is in the Natural Collection exhibition at the Manly Art Gallery and Museum until the 17 March 2019. It is my page from the collaborative artists' book Natural Collection featuring the work of 29 Warringah Printmakers Studio artists. 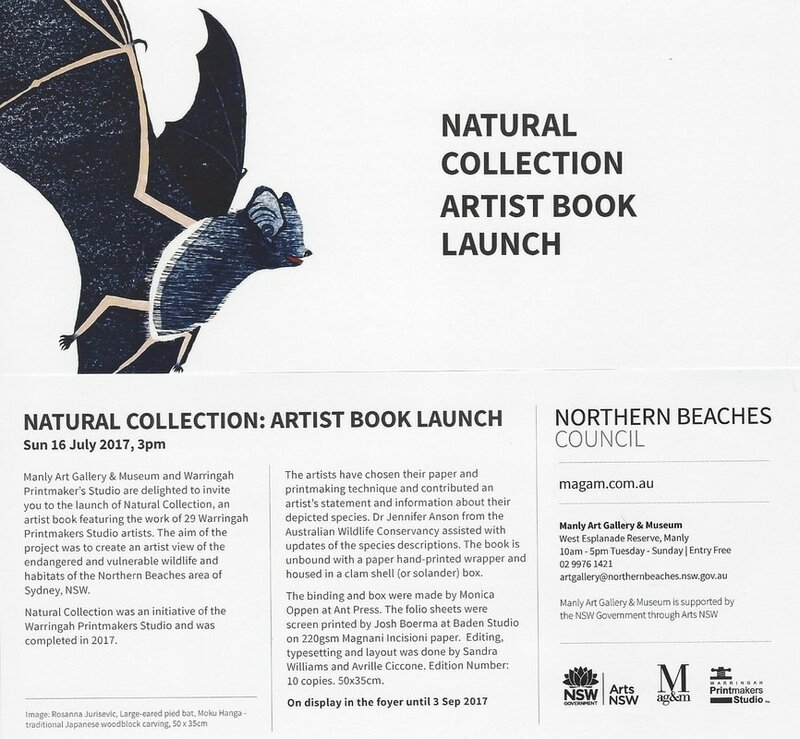 The images show each artist's response of the endangered and vulnerable wildlife and habitats of the Northern Beaches. This is a section of my oil painting "One Minute to Midnight, Full Moon November 2018 in Neptune's Garden of Eden" now showing until 25.1.2019 at the Korean Cultural Centre Sydney 255 Elizabeth Street Sydney. I will be demonstrating how to make a multi plate lino cut print on Sunday the 4th,come along and say Hi. I have three prints in this exhibition. ​I will be at the exhibition on Wednesday afternoons from 3pm. There are just over three hundred works to see! Exhibition on Show at Warringah Printmakers until 24.6.18. Blacktailed Godwit on the Eastern Flyway; Etching and Monoprint. Blacktailed Godwit at Rest; Monoprint, linocut and etching. I have three mixed media works in the "Fire" exhibition. The image below is a reduction linocut of a Banksia integrifolia seed which only germinates after the heat of a fire. Come along to see a range of works all with different interpretations about fire. 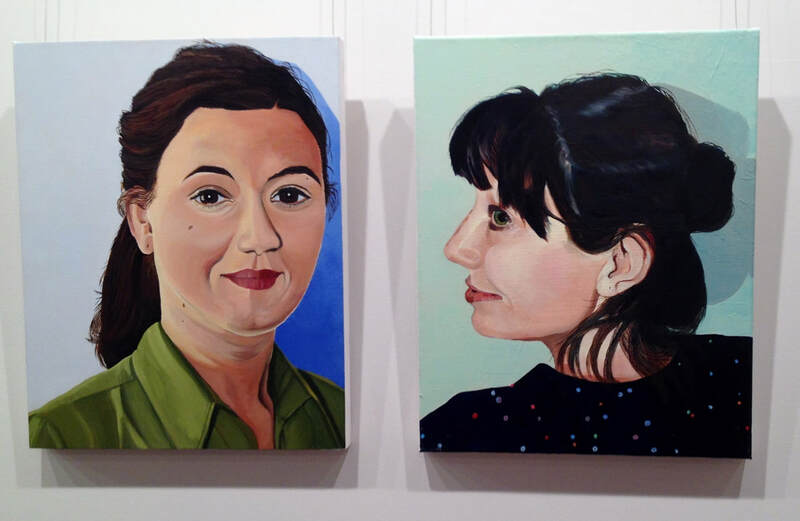 These portraits of Nina and Adrian my daughters, are in the International Woman's Day Exhibition at Hornsby Library 5 March until 18 March 2018. I selected these images for the exhibition as they are fine examples of contemporary women, strong and independent making their way in a tough world. I have two reduction linocut prints depicting coral in the Ku ring gai Art Society Autumn Exhibition. The Hornsby Art Prize Finalists Exhibition will be held at Wallarobba Arts and Cultural Centre, 25 Edgeworth David Ave, Hornsby from Wednesday 15 November through to Sunday 26 November. The Award and Opening Night will be held on Saturday 18 November 2017 from 6pm. 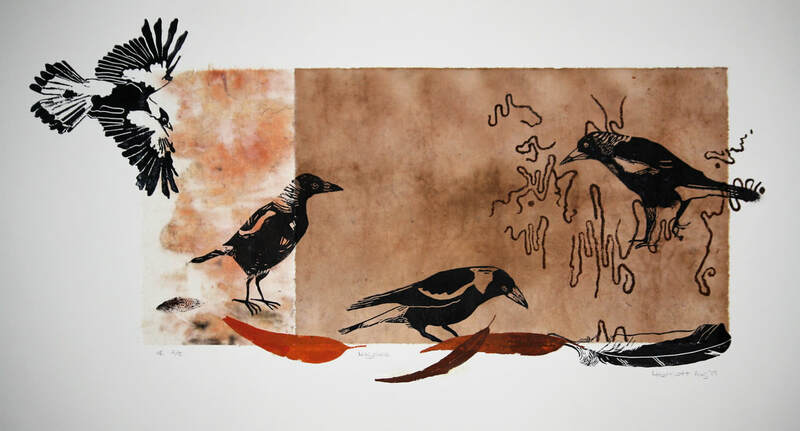 ​My linocut and monoprint Magpies is an entrant. This print "Long Reef" is an exhibition with the Art and Soul Group at the Glen Street Theatre until the 29.9.17 as a part of the Manly Arts Festival.